Friends and family came together to show their respects. It's been an incredibly emotional week since the passing of Christina Grimmie and the massacre of 50 people in an Orlando LGBT nightclub. However, the time has come to remember those we have lost and say goodbye to loved ones as remembrance ceremonies and memorials happen across the globe as a sign of solidarity. 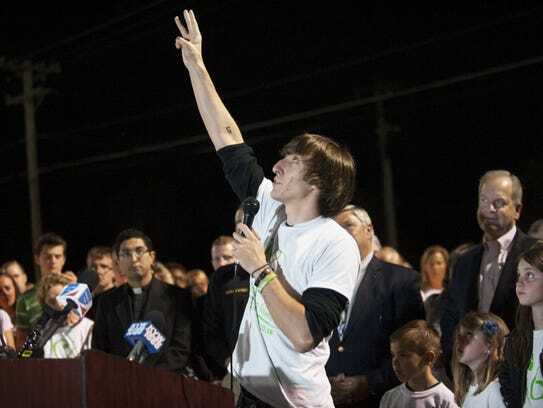 Last night, the town of Evesham, New Jersey, held their own candle-lit vigil to commemorate the life and sudden loss of 22-year-old YouTuber and musician, Christina Grimmie. Approximately 500 people travelled to Memorial Park to lay flowers, cameras, signs and photos to pay their respects to Christina before they all paused for a moment of silence amongst close friends and family of the hers. Marcus Grimmie spoke to the gathering whilst wearing a 'Team Grimmie Forever' t-shirt about the love he had for his sister: "Christina was awesome. She loved this town, this state; she loved the Lord and she loved me. She was just my baby sister". The Mayor of Evesham, Mr Robert Brown, announced to the people present at the vigil that Marcus was a hero based on his efforts to tackle the gunman and end his rampage, which prompted a huge swell of applause from the crowd. Talking more about the moment in which Christina was shot backstage at an intimate fan meet-and-greet experience, Marcus recalls that Christina "was arms wide open... she had no idea". Marcus also publicly thanked Adam Levine who recently offered to pay for Christina's funeral after being her coach during her time on The Voice, in addition to thanking Selena Gomez, a long-time friend who paid an incredibly teary tribute to Christina live on stage at a concert only days after her murder. To finish up his speech, Marcus turned his attention towards other gun-related tragedies that struck the nation over the weekend, when 50 LGBT people were murdered in a nightclub in Orlando: "About four miles away from where we were staying, there was a huge tragedy to Orlando, to the US, to the LGBT community, and to the whole world. I have no words. All of those people that died and are suffering, my heart goes out to you". We'll leave the final word to Mayor Robert Brown, who addressed the vigil gathering before a moments silence was held whilst Amazing Grace was played by the Camden County Society of Pipes and Drums: "You can cry and close your eyes, be empty, and turn your back. Or you can do what [Christina] would want: smile and open your eyes - smile, love, and go on". If you would like to pay your respects to Christina Grimmie, please feel free to leave your comments below.